CD review: "Something Heavy Going Down"
The theory put forth for "live" albums is that they can best capture the real feeling of a band and escape the sterility of the studio. In practice, however, it often seems as if the record label isn't just trying to generate new sales out of old songs. 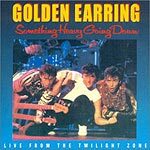 At least, that would seem the rationalization behind the release of Golden Earring's latest release, "Something Heavy Going Down." Included on the album are two of the band's biggest hits, "Twilight Zone" and "Radar Love." However, neither is equal to the original hit version. In fact, "Twilight Zone" here fails to capture the energy and enthusiasm of the studio version  so much for the theory behind "live" albums. The highlight of this album is "Mission Impossible," which Barry Hay makes work with his melodic vocals. But the rest of the album is flat, and makes you wonder why anyone hearing this would want to see the band in concert.